BoxOffice® — 'Captain America' Screenwriters Christopher Markus and Stephen McFeely on Creating An "Earnest Heroic Character"
When your breakthrough screenwriting job was the first Chronicles of Narnia, you're thrust near the top of the Hollywood totem pole and there's more room to go down than to climb. But Christopher Markus and Stephen McFeely landed a cherry gig as the writers of Captain America: The First Avenger, a big-screen adaptation of one of Marvel Comics' most iconic and enduring superheroes, and crafted an old-school adventure film that charmed critics and audiences alike. With Captain America arriving on DVD this week, Boxoffice caught up with Markus and McFeely to get the scoop on their plans for Captain America 2 and how their universe is getting shaped by Joss Whedon's The Avengers. What's the key to capturing an almost anachronistic sense of adventure while keeping it interesting for modern audiences? Stephen McFeely: I think we gave ourselves permission to be earnest, to have-I'll say it now-an old-fashioned character. There's so much pressure to have an angst-ridden, dark protagonist that, you know, overcomes his own selfishness or something. That wasn't always the case. Gary Cooper didn't do that. It was okay to have an earnest heroic character, and with Cap it seemed weird to apply something else. And Marvel was cool with that. Christopher Markus: And to sort of take the guy seriously, but be willing to have a little fun with the situations. Not mock them, not have it be wacky, but not have the tone be so dire that you begin to question that the man is dressed how he is. I mean, Batman can kind of pull it off—he's dressed all in black and he's very serious. But if you take that tone with Captain America, it pushes it over into the silly, because it's like, "If it's that dire, why are you dressed like that?" It's almost like Raiders of the Lost Ark in a way—if these situations or your enemies are that dangerous, why do you have a whip? Is there new footage on the DVD you're excited for audiences to get to see? McFeely: The easy answer is there's a scene called "The Battle At Azzano," which tells you how Bucky got captured. That totally made sense and if you put it into the movie, it would have been okay, but it made for a tougher transition, and I don't think anybody really needed it. It introduced you to Dum Dum and Dave Jones a little more organically than we've got now. So that's a scene that the movie wouldn't have been hurt by particularly, but it would have been two minutes longer. Knowing your script was going to be backed-up into The Avengers, how much did that limit your ability to tell a conclusive story? McFeely: Well, we knew from the beginning that we had to do that, that the special challenge was that we had to give an entire career to this guy. You know, if there were no Avengers, I guess there would be a temptation to just show Cap's first adventure and end it sometime in mid-1944, and then you would continue to tell WWII adventures possibly. But we had to do the whole thing and get him to the modern day, and so that sort of necessitated a montage part to it—why he got all of this street cred by leading guys into battle for a couple of years in the war. So it affected the story we told. Markus: But in terms of the romance, it's actually the key to the whole thing. We knew going all along that they were never going to get to walk off into the sunset together, and it makes every small moment that much more poignant in retrospect. Like if the movie ends and they're like, "Hey, let's finally go on that date and then they go on that date," you've seen that before, and that's just everybody's love life. McFeely: Yeah, it's not tragic, and we really liked the end being tragic. Markus: Yeah, what makes the romance memorable is the fact that it doesn't happen. Now that you're writing Captain America 2, is there a way to address this unresolved romantic relationship? McFeely: You mean how May-December can we get? Or does she have a daughter who happens to look exactly like Hayley Atwell? Does The Avengers acclimate Captain America to a contemporary world, so in your sequel he can just be a modern hero? McFeely: Well, there's always the iPod joke danger in both of these movies. But when we were first coming up with Cap 2 ideas, we certainly kept coming up against, "Well, I have no idea if Joss Whedon has already done this or not." So we couldn't really do much until we read The Avengers. It's fair to say that some of his new surroundings are addressed in The Avengers, but there's plenty for us to do, because that Avengers story is not just the story of Cap. By virtue of the fact that you've got all of these other characters, that story is not just him acclimating, there's a lot that they have to do. So we've got a lot of work ahead of us and a lot of stuff in mind. Markus: When Thor and Iron Man and Hulk are hanging around, you can't exactly grind the whole movie to a stop to have Steve sort of going, "...Microwave?" Will the timeline of your follow-up be concurrent with The Avengers, or will it be following those events? 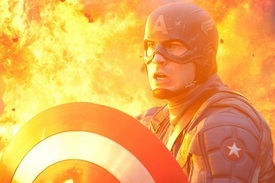 McFeely: Yeah, I think we can safely say it happens after Avengers. So he goes through The Avengers, and then Cap 2 happens. I can't quite tell you if Iron Man 3 or Thor 2, where they fit into the Cap story, but I think it goes Avengers, Iron Man 3, Cap 2 and Thor 2 all happen, and then I think Avengers 2—all in the hypothetical.